The #1 challenge for every sales team is to focus their efforts on their warmest leads. Get real-time data about people who visit your website and use this info to build a list of potential leads. Know exactly who has visited your site, which pages, how many times and when exactly. Use this data to build buyer personas. Prioritize who to contact first based on either when they visited your website or which pages they visited. Segment your leads into various categories, based on what they’ve read on your website and nurture them with relevant content. Web analytics can tell you how many people visit your site, but that data is anonymized. It’s certainly useful to help you get a general picture of what’s going on with your visitors, but it doesn’t tell you the specifics you’ll need to make better sales calls. Web visitor tracking tools, on the other hand, give you specific insights into what your visitors want. You can see what specific pages a particular lead was looking at, and from there you can better know which leads are most ready to buy. Moreover, you can sync all web visits with your sales CRM, enabling all of those people that were browsing your site to be filtered neatly into your CRM system, such as Pipedrive. 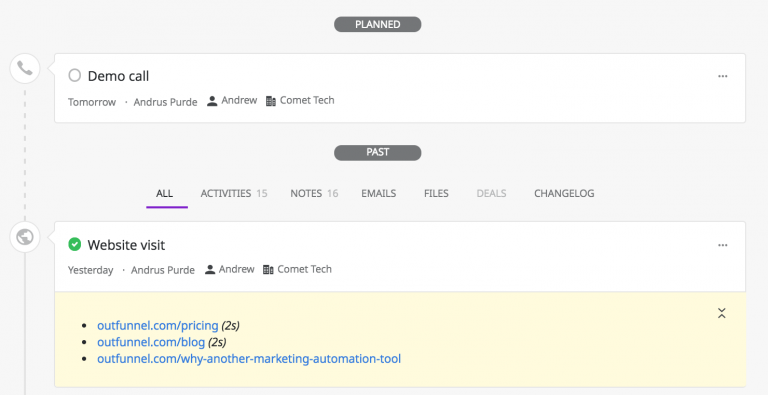 Please note that currently, this feature is available for companies that use Mailchimp to send newsletters and who have connected their Mailchimp account to Outfunnel. Should you have any questions our support team is here for your service: support@outfunnel.com. What pages are your existing customers spending a lot of time on? 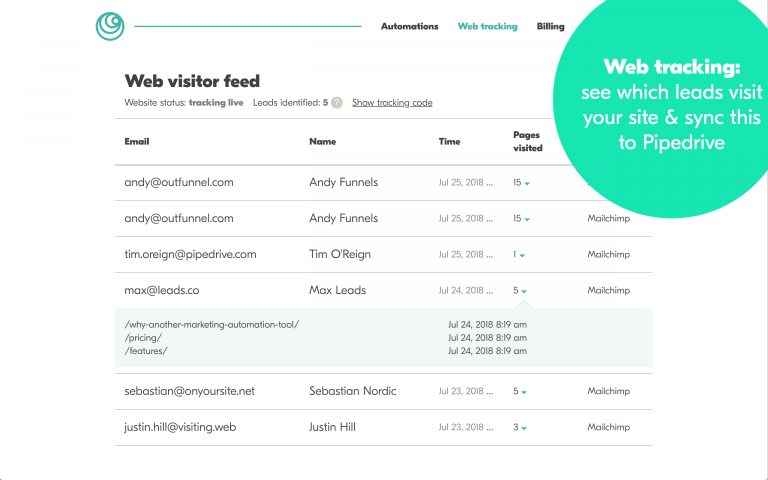 WIth web visitor tracking, you can find out! If a customer is spending time on a particular pair of support pages, for example, it might be a good idea to reach out to them. While web visitor tracking can seem like a magical crystal ball that helps you know everything about your customers, it’s important to respect your visitors’ consent!